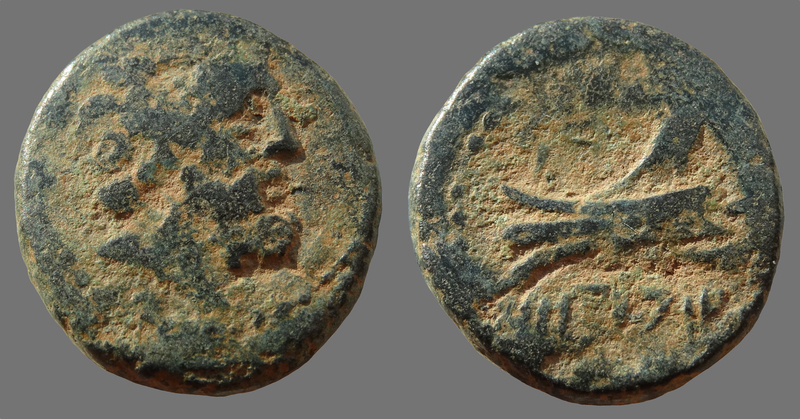 AE 16.53mm (Thickness 2.50mm), weight 3.59g, die axis = 12h (0 degrees), denomination C.
Obverse: Braided, bearded head of Zeus right, border of dots. Reverse: Triple pointed ram of Galley left, Phoenician letters nun (N) & daleph (D) above , Aradian era date 114 below. Ref: Duyrat 2005 Pg.61 No.2041-2042.